'Very, Very Courageous': Rick Welts On Jason Collins : The Two-Way The president of the NBA's Golden State Warriors came out in 2011. He said Monday that Collins' announcement helped him avoid a traffic ticket. 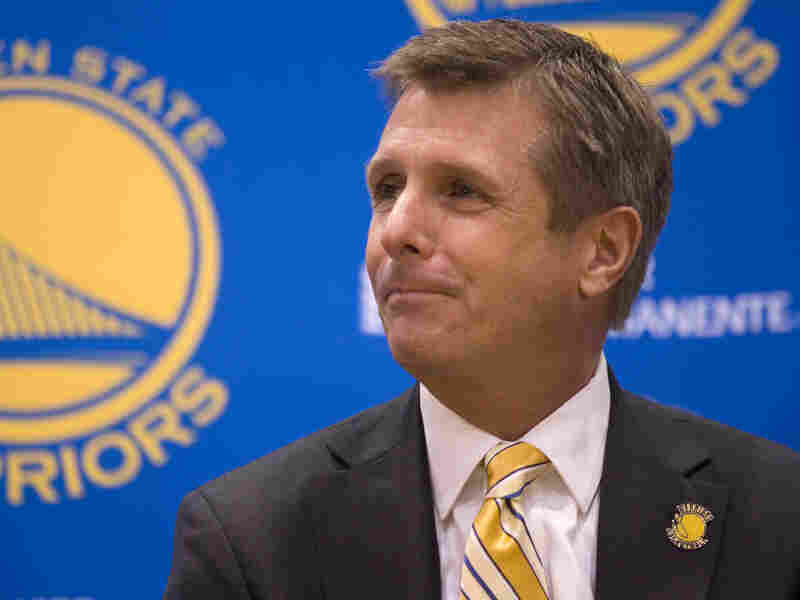 Rick Welts, the president and chief operating officer of the Golden State Warriors, recounted how Jason Collins' announcement helped him avoid a traffic ticket. One of the more interesting reactions to NBA player Jason Collins' announcement took place early Monday on a road in northern California. That's where Rick Welts, president of the NBA's Golden State Warriors, was driving to work. In 2011, when he was with the Phoenix Suns, Welts became the first major sports executive to come out. So naturally, as he puts it, his phone "started blowing up" Monday after the Collins story broke. And it almost cost him. A lot. As Welts drove on that northern California road, a state trooper pulled Welts over for driving and talking on his cellphone. "You got me," Welts told the cop, "but there's a funny story that goes with this. We had a player announce he was gay today." The officer asked who it was. Welts told him about Collins, whereupon the officer said to Welts, "So how's that going for YOU?" Welts said, "It's going pretty well." But not as well as when the trooper told Welts: "You've got a free pass today!" So Welts' first thank-you to Collins on Monday was for the $200 ticket he avoided. Welts told the story at an impromptu news conference with Bay Area reporters. He said he's very proud of Collins, calling what the basketball player did "very, very courageous." Welts said he's happy for Collins because "he'll be able to be the complete Jason Collins every day for the rest of his life" — a completeness Welts has felt since his public admission two years ago. He says he hopes Collins has an experience similar to his; Welts says there has really been nothing negative since his announcement in 2011. "I think it kind of defies logic," Welts says, "but of the thousands and thousands of people who reached out to me through emails or texts or letters, I did not get one truly negative response." Collins is a free agent, and Welts says if Collins gets another job in the NBA, it'll be because of his basketball abilities. "I think that's where we [pro sports] are," Welts says. "We've been lagging behind society, and I think we caught up today."